Sometimes only the artwork of an CD cover gets me triggered to check out the music. Maybe it is a kind of intuition but it never fails me. 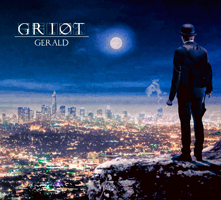 That was also the case with the artwork of the debut album “Gerald” of the Portuguese band Griot. The core of the band are the two multi instrumentalists João Pascoal and Sérgio Ferreira who composed this mini album (32:21) and imagined the concept of the story. The limited edition of this album exists out of a digipak with the CD and a 21 page storybook. “Gerald” is a concept album portraying the journey of Gerald, a man with many questions and fewer answers. It's an immersive journey about himself and something more, something grand, something new ... Gerald, a man of the land, on it's way to the Great City. In the storybook you will find 5 chapters, unraveling the story simultaneously with the music of the album. It features artwork of Maria Branco. So the album is also divided into 5 chapters. This means that that you can find 5 tracks on this album; “The Drive” (Chapter 1), “Through the Haze” (Chapter II), “Into the Fold” (Chapter III), “The Curtain Falls” (Chapter IV) and ”Fadeaway” (Chapter V). “The Drive” opens with ambient and mysterious keyboards and the music develops into a jazzy and mellow kind of prog with nice synthesizer and delicate guitar parts. You can also find some nice piano and keyboard strings on this opener. Only in the last minute of this five minutes track you can find some vocals. This is done in a delicate and attractive way. The vocals of Nuno Aleluia are accompanied with backing vocals of António Branco ... Very nice. In this part you will also notice for the first time the delicate use a a real string ensemble with violins and violoncello. This gives the music a soft classical touch. “Through the Haze” opens with bass, strings, the flute of André Loureiro and the saxophone of Andy Panayi. The later gives the piece a more jazzy groove. But in overall the music stays relaxed and mellow. With “Into the Fold” the music becomes more progressive and powerful. The music is diverse and you can find beside the great progressive parts with delicious keyboards and guitar parts also a jazzy section with the clarinet of Paulo Bernardino. Also the the vocal melodies are very nice. This is absolute my favorite track so far. Chapter IV “The Curtain Falls” starts with beautiful keyboard strings and a delicate piano part. The slow sung vocals are blissfully sung and the flute gives the piece character. By now you will be impressed by the thought that you are listening to a debut album of a bunch of young people. The music is just gorgeous and the album sounds great. There is also a little musical trick that the band uses at the end of this chapter. The tension of the music is rising towards a kind of climax with passionate sung vocals and delicious keyboard Mellotron like strings and than the music suddenly stops. As a listener you are left amazed and longing for more. The Italian band The Watch also uses this trick on their own albums. Sometimes a little bit frustrating but it works in a very effect-full way. The album closes with ”Fadeaway” (Chapter V). The delicate piano opening is composed and played by André Barros ... Very beautiful. Talking about beautiful, in this longest track (10:34) of the album the real string ensemble and the keyboard strings are combined with beautiful vocal harmonies and delicate flute and acoustic guitar parts. The melodies are great on this album. Halfway the track Diogo Santos plays a nice Moog synthesizer solo. This longest chapter of “Gerald” is the highlight of this wonderful album. Well this is a welcome surprise ... What a beautiful album and nice concept. The music is diverse and the album sounds great. I would like to describe the music as a mellow mix of progressive, jazzy and classical atmospheres. The music sounds relaxed and the album has a nice atmosphere. All the instruments are nicely integrated into the music. I love the delicate use of a real string ensemble. There is only one thing ... With just more than 32 minutes of music this album is to short. On the other hand this is also a compliment towards the band ... We want more! I am very curious how the music of this band will develop in the near future. If you like the mellow side of progressive rock, this one is for you.